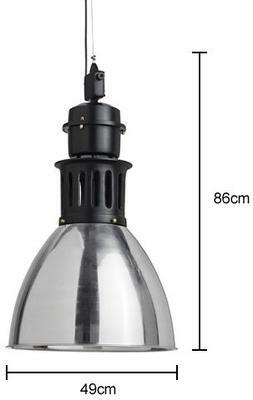 This Black Industrial Ceiling Lamp makes for a fantastic touch inside your home. It's gorgeously designed to showcase a chunky half dome look perfect for adding a statement to your ceiling. The lamp is shaped from metal and painted in a black matt finish. It's then gorgeously distressed to look like it's been sitting inside your garage or home for years and years. There's matching chunky chair which you can use to hang the ceiling as low or high as you want. It requires a 40-watt light bulb to provide proper, even lighting. Hang this above your stairwell, dining table or inside your living room. It should make quite a statement.